AMCO Transmissions and Total Car Care is one of the most trusted and recognized automotive brands in the country. Even more than that, as we celebrate our 50thanniversary, we also celebrate our status as a true American icon. It all started back in 1962. Or was it 1963? Or 1957? Actually, AAMCO could celebrate its origins on any of those dates as our illustrious company history shows. So why have we decided to celebrate our 50th across 2012 and 2013? Because those dates mark numerous milestones—the birth of the business concept for a “chain” of transmission repair franchises in 1962, along with the company’s incorporation and opening of the first truly franchised center in Newark, NJ in 1963. In 1938, Oldsmobile developed the first line of cars that featured automatic transmissions, otherwise known as Hydra-Matic drives. By the 1950’s the automatic transmission had become a popular option on numerous car makes and models. With the proliferation of the automatic transmission came the need for specialized care and repair. Enter Anthony A. Martino. Martino was born January 7, 1933. He grew up and became a respected mechanic/technician from the Northeast section of Philadelphia. It was while working as a mechanic at Milt Knapik’s ESSO service station on Philadelphia’s Roosevelt Boulevard and Devereaux Ave. that Tony Martino launched what would become an entire industry. Martino saw a big opportunity repairing automatic transmissions so he rented a lift from Knapik’s ESSO to do side work including transmission repair. Soon afterward, motorists from around the area recognized Martino’s expertise and brought their transmission work to the little ESSO station. By 1957, with the demand for his signature transmission repair service booming, Martino opened his first repair shop three miles from the ESSO station at 133 East Eleanor Avenue in Northeast Philadelphia. He called the shop AAMCO Auto and Truck Repair as he did engine and other minor repairs at the shop beyond transmissions. At this time, people became aware that the AAMCO acronym stood for Anthony A. Martino Company. The name was easy to remember but also marketing genius for its top alphabetical listing in the yellow pages under auto repair, as there was no separate “Auto Transmission” category at the time. Rich Silva and Walt DeLutz, who also realized the rapidly growing need for automatic transmission repair service. Together, they opened several shops in the area. Even then, Martino recognized that “trust” and “reputation” were key to attracting new customers. Realizing a customer service problem at one shop could negatively affect the reputation of others, he started selling his transmission company under different brands. Tony’s original shop moved to a bigger space around the corner at North Front Street (where the first AAMCO corporate office was to open across the street). His shop remained AAMCO. The other shops traded under separate names. 1962: The AAMCO brand is born. In the early 60’s, franchises began growing as the interstate highway network gave traveling consumers a desire to have their “favorite brands” available wherever they happened to be. McDonald’s and Holiday Inn were the big names in early franchising and Martino saw potential in the concept right from the start. He just lacked the business background to do it. Enter Robert Morgan. Robert Morgan was born Henry Morgenstern the Bronx in 1917. His family owned a neighborhood deli where Morgan spent his early years. However, Morgan was not born to run the family deli. Instead, he dreamed of being a professional dancer and attended the American Academy of Dramatic Arts and then the City College of New York. Unfortunately, World War II would put those dreams on hold. Soon after World War II (during which he served in the Army), Morgan resettled in Detroit where he combined his business acumen with his love of dance and opened the Robert Morgan Studio of Dance. With franchising growing in popularity alongside that of the Arthur Murray Dance Studios, Morgan set out to franchise his dance studio concept, ultimately reaching 40 studios across the country. By the late 50’s/early 60’s, Rock n’ Roll was the rage and the party was over for ballroom dancing’s popularity. So with franchising now surpassing dance as Morgan’s passion and seeing the opportunity in the automotive aftermarket while living in the motor city, Morgan relocated to Philadelphia where he saw the popularity of Martino’s shop and the franchising possibilities for the AAMCO Transmission concept. In 1962, he approached Tony Martino with the idea to franchise. Morgan was the ideal franchising partner Martino was looking for to grow his AAMCO chain and the separately branded shops were renamed AAMCO and the brand was “officially” born. 1963: AAMCO opens its first “franchised” center and incorporates. There is much debate over who opened the first AAMCO franchise. Many believe it is former Martino employee and current operator, Tony Manero. While he was the first operator outside of Martino to run an AAMCO center, he was never truly a franchisee. Manero was given ownership of the North Front Street location before moving around the corner to Rising Sun Avenue where his center still operates today. The real answer is that Ivan Ginninger and his brother Jack were the first to purchase an AAMCO franchise from Martino and Morgan in 1963. Within two weeks, the center was in the black and the AAMCO franchising phenomenon was on well on its way. John Feldman and Don Saffiotti opened the second AAMCO franchise later in 1963 in Hackensack, NJ. Saffiotti.Making 1963 even more eventful, AAMCO Automatic Transmissions was incorporated that November. A household name is created. AAMCO was also one of the first advertisers to use celebrities in its television commercials. Its first commercial, shot in the early 60’s, featured Zsa Zsa Gabor. The commercial was an instant success and started a long line of award-winning ads for the chain. Humor was a mainstay of AAMCO advertising throughout the 70’s, 80’s and 90’s all while building the brand and communicating AAMCO’s competitive offerings: nationwide warranty, diagnosis of minor transmission problems from major ones, expert knowledge of all make and model transmissions, the number of transmissions serviced, and in the mid-2000’s, the company’s entrée back into total car care. During that time, famous names like Claude Aikens and later James Brolin became spokespersons for the AAMCO brand. Brolin’s much-publicized marriage to Barbara Streisand also worked to earn AAMCO a lot of media coverage by late night talk-show hosts, such as David Letterman and Jay Leno. The AAMCO signature “BEEP BEEP” would also become the theme for one of the more memorable episodes of Larry David’s Curb Your Enthusiasm. In the episode, originally aired in 2000, Larry test-drives Jeff’s car when the AAMCO commercial comes on and he mistakes the commercial’s BEEP BEEP for the driver behind him honking his horn. Funny enough, in the episode they are test-driving a ’57 Chevy. It is that same vehicle responsible for the original BEEP BEEP horn in the brand signature. Also during the 90’s and early 2000’s, local personalities began voicing AAMCO commercials on both radio and TV. Names such as Tommy Lasorda, Ron Jaworski, Alice Cooper, and many more radio personalities would experience the “Double A” AAMCO service for themselves and promote their experiences to millions. As cars became more complex and vehicle systems more interconnected, the automotive service market evolved – moving from specialist-based care to total automotive care. AAMCO changed with the market and moved to communicate its full-service capabilities to the public in the mid 2000’s by partnering with the Indy Racing League and driver Sarah Fisher in 2007. Most recently the brand has returned to its roots using humor to help deliver the message that for over 50 Years AAMCO has been repairing the most complicated part of your car, the transmission, making them the obvious choice for everything on your car. The signature BEEP BEEP remains prominent, as well, and according to current Vice President of Marketing, Jack Bachinsky, “The current ‘We Hear You’ campaign allowed us to make light of a very real situation – consumers identifying car problems with noises – all while allowing us to play on our history of reliable and expert service and of course keeping our iconic Double A (BEEP-BEEP) M-C-O signature.” He credits the company’s current ad agency, Qorvis Communications of Washington DC, for the research and concept behind the spots. In honor of our 50th. To mark its 50th Anniversary, AAMCO has created celebratory posters and center materials for centers that commemorate some of the major events that have occurred since they first opened their “garage” doors. Also in honor of the 50th, AAMCO has produced two new TV commercials that started airing in June 2012. “We Hear You – 50th Anniversary” is the third commercial in the campaign featuring customers at AAMCO centers mimicking the noises their cars are making. In honor of AAMCO’s 50th anniversary, they follow the same couple from 1963 up through today in time-appropriate age, hairstyle and dress as they come into AAMCO dealerships, make noises and get an expert diagnosis from the technicians. 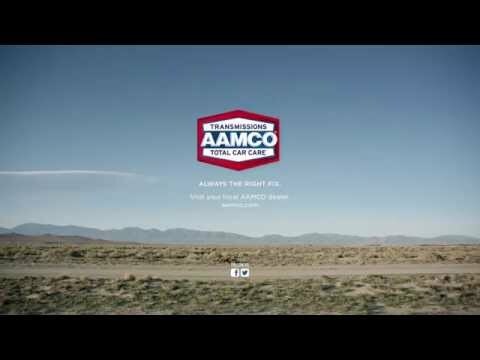 “Trust” launches a new campaign for AAMCO based on the idea that you can trust AAMCO to fix the most complicated part of your car (the transmission), so why wouldn’t you trust them to fix anything on your car? Conceptually, the spot pushes that simple question by demonstrating examples of people you would never trust to do the job right…in a very unexpected way. From 1983 to 2006, the iconic AAMCO building at the City Line Avenue exit of the Schuylkill expressway welcomed Philadelphia-area commuters into the city limits. The company took the building over from Gulf Oil and spelled out AAMCO across the side of the building in two-story high letters—it was a familiar Philadelphia sight to motorists sitting in rush hour traffic on the city’s notorious Schuylkill Expressway. Before then the company was headquartered in Bridgeport, PA after outgrowing its original offices on North Front Street. Since 2006, the company’s headquarters have been located in Horsham, PA with a new Western Region Support Center opening in San Diego in 2011.